Treatments using Chinese Cups (static and massage) are suitable not only for the treatment of infections of the upper respiratory tract – discovered their various medicinal properties and cosmetic. Massage bubbles is used in the treatment of asthma, stomach problems, high blood pressure, boils, hemorrhoids, diseases of the joints, muscle pain, neuralgia, torn tendons and any infections. Massage cupping stimulates circulation of blood and body fluids, it helps to get rid of waste products and toxins from the body. Massage bubbles brings excellent results in cellulite treatment as a result of the acceleration of metabolism causes fat reduction. Bubble formerly also used for the removal of foreign bodies and parasites from the skin and venom bites of insects and snakes. In addition to the general contraindications for massage, massage bubbles should not be performed in the case: the fragility of vessels, cracks or tendency to the formation of “bruises” in the vicinity of the blades, spine (is acceptable surroundings of the 7th cervical vertebra), breast, heart, lymph nodes, facial , neck, medial area. upper and lower limbs, kidney, stomach and side area. chest. Warning! During the massage can break small blood vessels, leaving the application site bruising, which after a few days to absorb and disappear. Bubbles massaging mainly back and if it is cosmetic massage (cellulite), this massage are also subject to the buttocks, thighs and arms. The treatment is carried out not more than once every 2 days. 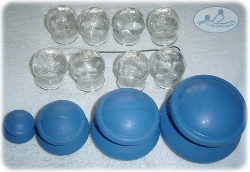 If you are looking for the surgery, which perfectly suited to fight cellulite, firming and model the your body and relaxes tense muscles at the same time preventing pain, I encourage you to use with cupping massage.